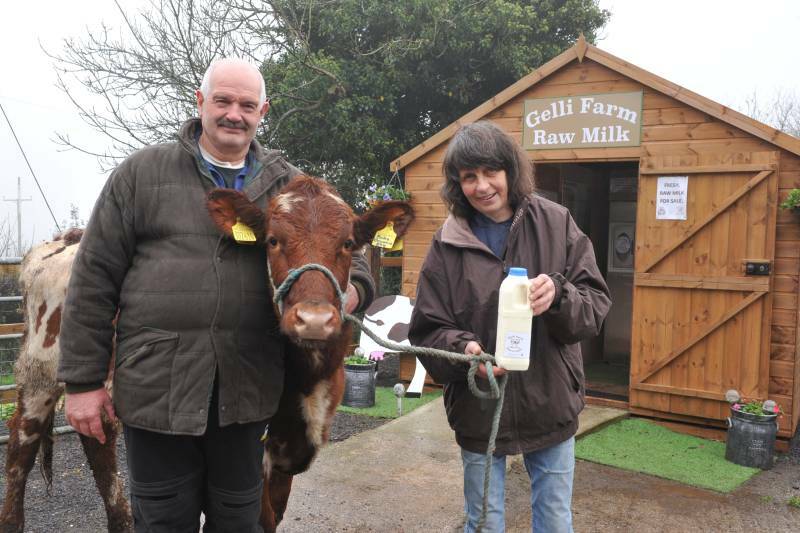 A vending machine dispensing raw milk produced by one of the last remaining pedigree Ayrshire herds in South East Wales has helped to secure the future of that herd. Robert and Kath Granville, who farm at Cefn Cribwr, near Bridgend, were almost forced out of business by the low price they were receiving for their milk. At its lowest, the price they were paid by their buyer plummeted to 9.75p a litre. The prospect of losing the Gelligaredig herd that Robert’s family established at Gelli Farm in 1945 resulted in sleepless nights, but it was that wakefulness that was to be their saviour. It had been suggested that the couple look into selling raw milk from the farmgate. Robert often had sleepless nights researching on the internet as to what that might involve. The Granvilles' eventually secured funding through the Farming Connect Advisory Service, which is in turn funded by the European Agricultural Fund for Rural Development and the Welsh Government. "Russell could see a niche for what we had in mind and his business plan demonstrated that could make it work with the number of cows we had," says Kath. After a series of Food Standards Agency tests, they were licenced to sell raw milk on their farm. The couple invested £14,100 in a vending machine, established a retail area at their farm gate and opened for business. Daily sales have since averaged 55 litres, with customers within a 30-mile radius paying £1.20 for a litre of milk or £2.20 for two litres compared to the 18 pence per litre they currently receive for their bulk milk sales. "We get a very broad cross section of customers, people from different ethnic backgrounds," says Robert. "Some of those customers buy it to make cheese, clotted cream and yogurt but many others just buy it to drink or to pour on their bowl of cereal." That milk is sold fresh from the vending machine daily. “The tank in the vending machine holds 200 litres so there is going to be some milk left over but it doesn’t go to waste, we feed it to the calves," says Robert. Marketing has been important and this is where the couple’s three daughters, Mary-Jayne, Beth and Kate, have supported the venture. "The girls have been fantastic, they have taken care of all the social media side of it," says Kath. "They love the farm and it is because of them that we have really fought to keep the business going."